A sample of "Don't Know Why"
In the US, Come Away with Me debuted at No. 139 on the Billboard 200 before climbing to No. 1 in January 2003, almost a year after its release. In total the album has appeared on the Billboard 200 164 weeks. It was certified platinum from the Recording Industry Association of America on August 22, 2002. It went on to sell over ten million copies over the next year, and on February 15, 2005, was certified as a diamond record by the RIAA. As of March 2016, the album has sold 11.1 million copies, making it the eleventh best-selling album of the Nielsen SoundScan era in the US. The album sold approximately 26 million copies worldwide. In Germany, though the album debuted at just No. 37, it nevertheless stayed for a total of 141 weeks on the official German Albums Chart and it managed to reach No. 2 in its 37th week on that chart, where it stayed for 4 weeks. In the end, Come Away with Me sold 750,000 copies, reaching 5× gold, being her most successful album in that country and one of the longest-staying albums on the German Albums Chart. Polyphonic HMI's "Hit Song Science" software predicted the album's success months before its release, contradicting skeptical executives. Come Away with Me received acclaim from music critics. At Metacritic, which assigns a normalized rating out of 100 to reviews from mainstream critics, the album has an average score of 82 out of 100, which indicates "universal acclaim" based on 9 reviews. The album received 3.5 out of 4 stars from both the Chicago Sun-Times and the Los Angeles Times reviews. AllMusic's David R. Adler wrote that "while the mood of this record stagnates after a few songs, it does give a strong indication of Jones' alluring talents." Robert Christgau of The Village Voice cited it as "the most unjazz album [Blue Note] has ever released" and criticized that "Jones's voice dominates the record" because "her main writers are pretty anonymous", although he found it to be a "sincere" and "exemplary biz success story in which the good guys win." In his Consumer Guide, Christgau picked out her cover version of Hank Williams' "Cold, Cold Heart" as a "choice cut",( ), calling it "a good song on an album that isn't worth your time or money". The A.V. Club gave it a favorable review and called the album "A showcase for Jones' remarkable voice, the disc captures a singer whose rare instinct for interpretation always serves the song, rather than working against it." E! Online gave it an A and stated: "Gorgeous and intimate, the 14 songs on her debut disc ache with romantic maturity and a smart, slow-jam sexiness that belies the fact that, at 22, Jones is hardly older than Britney Spears." Kludge included it on their list of best albums of 2002. I felt like I went to somebody else's birthday party and I ate all their cake. Without anybody else getting a piece. That's how I felt. Rolling Stone ranked Come Away with Me at number 54 on its list of the 100 Best Albums of the Decade. 13. "The Long Day Is Over"
1 2 3 4 5 Adler, David R. "Come Away with Me - Norah Jones". AllMusic. Retrieved 2008-08-06. ↑ "Music: Come Away with Me (CD) by Norah Jones, 106257836". Tower.com. 1 2 "The Humility of Norah Jones, She Says Her Dominance at the Grammys Made Her Feel Bad". CBS Interactive Inc. February 8, 2007. Retrieved 2008-08-06. 1 2 3 "RIAA Searchable Database". Recording Industry Association of America. Archived from the original on September 2, 2008. Retrieved 2008-08-06. 1 2 Brown, Helen (April 27, 2012). "Norah Jones, Little Broken Hearts, CD Review". The Daily Telegraph. Retrieved April 29, 2012. ↑ Dodd, Bobby (May 1, 2002). "Norah Jones: Come Away With Me". All About Jazz. Retrieved February 25, 2013. ↑ Kaplan, Ben (March 22, 2012). "Norah Jones finds a beguiling new voice". National Post. Postmedia Network. Retrieved July 21, 2016. ↑ "Top 200 Albums - 2015-02-28". Billboard. Retrieved July 21, 2016. 1 2 Caulfield, Keith (February 7, 2016). "Adele's '25' Sales Surpass 8 Million in the U.S.". Billboard. Retrieved March 1, 2016. ↑ "Gold-/Platin-Datenbank ('Come%20Away%20with%20Me')" (in German). Bundesverband Musikindustrie. ↑ "Die ganze Musik im Internet: Charts, News, Neuerscheinungen, Tickets, Genres, Genresuche, Genrelexikon, Künstler-Suche, Musik-Suche, Track-Suche, Ticket-Suche". musicline.de. Retrieved 2012-02-10. ↑ Studio 360 commentary. October 1, 2004. Accessed on: March 19, 2009. 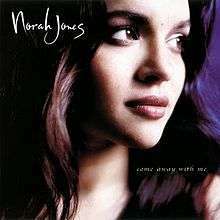 1 2 3 "Reviews for Come Away with Me by Norah Jones". Metacritic. Retrieved July 21, 2016. 1 2 Wisser, Emerick Jeff (March 31, 2002). "Norah Jones, 'Come Away With Me' (Blue Note)". Chicago Sun-Times. Retrieved November 12, 2013. ↑ Blumenfeld, Larry (March 8, 2002). "Come Away With Me". Entertainment Weekly. Retrieved November 12, 2013. ↑ Fordham, John (March 1, 2002). "Bobby's on a roll". The Guardian. Retrieved July 8, 2016. 1 2 Hilburn, Robert (March 17, 2002). "Norah Jones Weaves a Haunting Allure". Los Angeles Times. Retrieved November 12, 2013. ↑ Moon, Tom (March 28, 2002). "Norah Jones: Come Away with Me". Rolling Stone. Archived from the original on October 14, 2007. Retrieved November 12, 2013. ↑ Brackett, Nathan; Hoard, Christian, eds. (2004). The New Rolling Stone Album Guide. Simon & Schuster. pp. 439–40. ISBN 0-743-20169-8. ↑ Green, Tony (April 2002). "Norah Jones: Come Away with Me". Vibe: 168. Retrieved November 12, 2013. ↑ Christgau, Robert (March 11, 2003). "What's Not to Like? Norah Jones". The Village Voice. New York. Retrieved February 25, 2013. ↑ Christgau, Robert. "CG: Norah Jones". RobertChristgau.com. Retrieved November 12, 2013. ↑ Christgau, Robert. "CG 90s: Key to Icons". RobertChristgau.com. Retrieved November 12, 2013. ↑ Phipps, Keith (February 26, 2002). "Norah Jones: Come Away With Me". The A.V. Club. Retrieved November 12, 2013. ↑ "Come Away With Me > Charts & Awards". All Media Guide, LLC. Retrieved 2008-08-06. ↑ "100 Best Albums of the 2000s". ↑ "Amazon.com: Norah Jones: Come Away With Me (Limited Edition): Music". amazon.com. 1 2 3 4 5 6 7 8 9 10 11 12 13 14 "Norah Jones – Come Away With Me". ultratop.be. Retrieved 2012-06-02. 1 2 3 4 5 6 "Norah Jones - Come Away With Me". acharts.us. ↑ Davidalic. "LISTAS DE AFYVE". afyvecharts.blogspot.co.nz. ↑ "South Korea Gaon Album Chart". On the page, select "2013.12.08~2013.12.14" to obtain the corresponding chart. Gaon Chart Retrieved December 22, 2013. ↑ "Oficjalna lista sprzedaży :: OLIS - Official Retail Sales Chart". OLiS. Polish Society of the Phonographic Industry. Retrieved April 25, 2014. ↑ "End of Year Album Chart Top 100 - 2002 - Official Charts Company". ↑ "End of Year Album Chart Top 100 - 2003 - Official Charts Company". ↑ "End of Year Album Chart Top 100 - 2004 - Official Charts Company". ↑ "Archived copy" (PDF). Archived from the original (PDF) on January 17, 2016. Retrieved 2011-11-22. ↑ "Discos de oro y platino" (in Spanish). Cámara Argentina de Productores de Fonogramas y Videogramas. Archived from the original on July 6, 2011. Retrieved October 14, 2012. ↑ "ARIA Charts – Accreditations – 2012 Albums". Australian Recording Industry Association. ↑ "Ultratop − Goud en Platina – 2004". Ultratop & Hung Medien / hitparade.ch. ↑ "Brazilian album certifications – Norah Jones – Come Away with Me" (in Portuguese). Associação Brasileira dos Produtores de Discos. ↑ "Canadian album certifications – Norah Jones – Come Away with Me". Music Canada. ↑ "French album certifications – Norah Jones – Come Away with Me" (in French). Syndicat National de l'Édition Phonographique. ↑ "InfoDisc : Les Certifications (Albums) du SNEP (les Disques de Diamant)". infodisc.fr. ↑ "Gold-/Platin-Datenbank (Norah Jones; 'Come Away with Me')" (in German). Bundesverband Musikindustrie. ↑ "Greek album certifications – Norah Jones – Come Away with Me" (in Greek). IFPI Greece. ↑ "Certificaciones – Norah Jones" (in Spanish). Asociación Mexicana de Productores de Fonogramas y Videogramas. ↑ "Dutch album certifications – Norah Jones – Come Away with Me" (in Dutch). Nederlandse Vereniging van Producenten en Importeurs van beeld- en geluidsdragers. ↑ "New Zealand album certifications – Norah Jones – Come Away with Me". Recorded Music NZ. ↑ "Polish album certifications – Norah Jones – Come Away with Me" (in Polish). Polish Society of the Phonographic Industry. ↑ "Spanish album certifications – Norah Jones – Come Away with Me" (PDF) (in Spanish). Productores de Música de España. Select the "Chart", enter 2004 in the field "Year". Select '' in the field "Semana". Click on "Search Charts"
↑ "Guld- och Platinacertifikat − År 2003" (PDF) (in Swedish). IFPI Sweden. ↑ "The Official Swiss Charts and Music Community: Awards (Norah Jones; 'Come Away with Me')". IFPI Switzerland. Hung Medien. ↑ Jones, Alan (October 14, 2016). "Official Charts Analysis: Green Day claim top spot with Revolution Radio". Music Week. Intent Media. Retrieved October 15, 2016. (subscription required (help)). ↑ "IFPI Platinum Europe Awards – 2008". International Federation of the Phonographic Industry. Harry for the Holidays by Harry Connick, Jr.
Only You by Harry Connick, Jr.